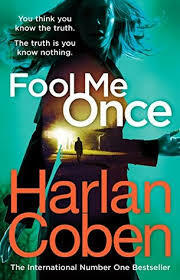 Fool Me Once by Harlan Coben has been on my 'to be read' list for a little while, and I finally got around to reading it recently. Its fast-paced plot and gripping storyline proved to be a real page turner, however, I must say that by the end of the story, it was just an ok read in my opinion. The story begins with the main character, Maya Burkett attending the funeral of her husband Joe, who was murdered three days earlier. Maya was witness to the murder, but things get a little confusing when Maya thinks she sees Joe on her nanny cam (she has a two-year-old daughter Lily), days after his death. Maya's sister was also murdered a few months prior to Joe's death, and Maya, who is a retired helicopter pilot, tries to piece together the final stages of both her husband and her sister's lives. There are so many twists and turns throughout the storyline, as well as a few dodgy characters that added to the suspense. Without giving too much away, I must say that the lead up to the ending was a bit of a let down, but I did enjoy the epilogue (which was set 25 years later), as it concluded the story well. Overall, Fool Me Once is a rather enjoyable read, even though the ending was slightly disappointing. If you like books that keep you on the edge of your seat, then this is ideal for you.